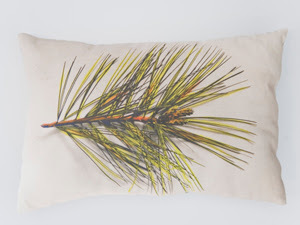 Pillows like the one shown above can be custom made from your favorite images!!! 1. To begin, scan the photo and save to your computer's desktop. Photos of nature, patterns, close-ups of textures and tiny objects will create unique designs that can be seasonally shown or used year round. 2. Visit spoonflower.com, and upload your image to create custom fabric. The site gives you detailed instructions and options for repeating and placing the image, as well as fabric color and size (be sure to include at least a half-inch border around the image for seam allowance). If you'd like to see the fabric in person, order a sample for just $5.